A large and noisy flock of black cockatoos flies over at 7:00 am, waking us. We linger in bed and after the 7:45 ABC Radio news we get up at 8:00 am. This is our usual practice. Once again we take our time and leave at 9:30 am. It is now about 16ºC. 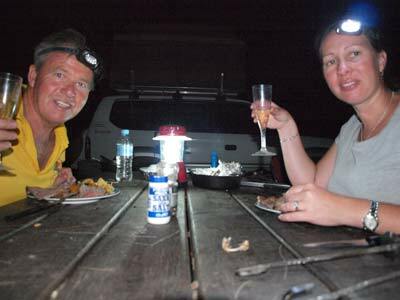 We have to stop again in Tenterfield as we pass through as we need to top up with water and also refuel the Prado. We get to Tenterfield at 10:00 am and park again in the BiLo car park. While I refill our water tanks, Kelly buys some fresh bread and a couple of other minor things. From here we head out of town and stop at a petrol station. We purchase 89 litres at $1.429 a litre, total cost $127.21. We have travelled 590 kilometres since we refuelled before Christmas at an average of 15.1 litres per 100 kilometres. We leave Tenterfield at 10:30 am. It is now sunny and 22ºC. We head south down the New England Highway and at the town of Deepwater we turn off and head towards Emmaville. We arrive at Emmaville at 11:27 am, 80 kilometres from Tenterfield. As far as I know, it is famous for only one thing. 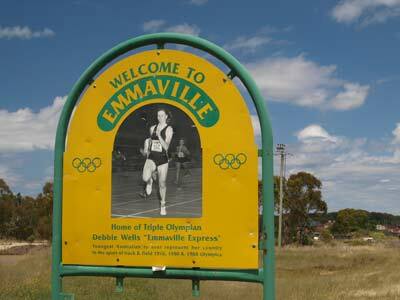 Back in the 1970s a girl called Debbie Wells became known as the "Emmaville Express". She was a sprinter and represented Australia at the 1976, 1980 and 1984 Olympic Games. At the 1976 games at age 14 she became the youngest person to represent Australia in track and field. As we enter the town there is a sign celebrating Debbie's achievements. We stop at the first pub, the Club Hotel. We order a beer and sit out on the verandah. It is a beautiful day, very nice to be sitting here having a beer. Emmaville has a gold mine or two and there appears to be very productive farmland around the town. I go for a walk to the shop up the road and purchase a newspaper (the Sydney papers were not in at Tenterfield). I see that this is a very nice little town, with a couple of nice pubs and a beautiful post office and Police station. After the beer, we go for a short drive to look at the buildings. We notice that opposite the other hotel there is a mining museum. We probably should have stopped to have a look. We leave at 11:50 am. We are heading out towards the west before turning south. A bit further down the road we stop to cut some timber for our fire tonight. Soon after this we see a strange thing coming towards us, it looks like a UFO! Turns out that it is a grain silo on top of a trailer behind a car. We have to pull off the road to let it pass. 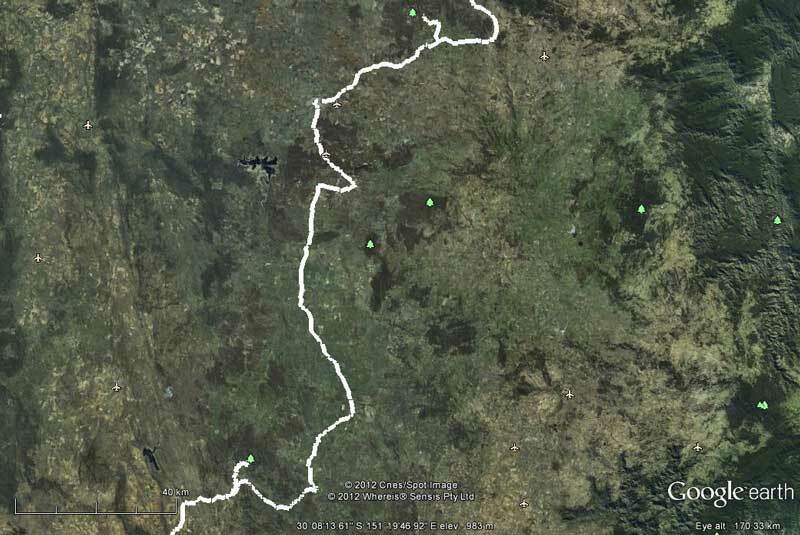 When planning this trip I had a lot of problems trying to find out how to get to Kings Plains National Park. The web site has almost useless directions , referring to roads and localities that I cannot find on any map or even topographical map. I think I have worked out where it is. 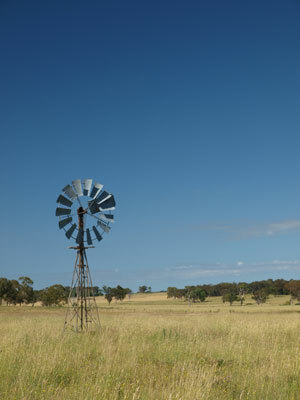 We head south towards a locality called Wellingrove. This is on the road back to Glen Innes. If you are coming from Sydney you would go via Glen Innes. At Wellingrove we take the Kings Plains Road which runs to the west. I think there is a sign here pointing to the national park. It is now 12:40 pm and we are almost 37 kilometres from Emmaville. 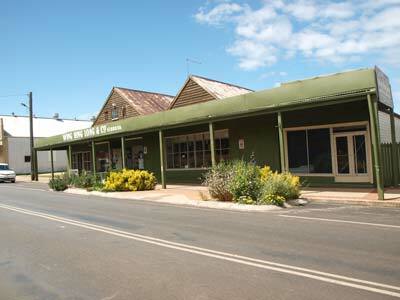 We travel along Kings Plains Road for 14.8 kilometres, passing through Kings Plains (nothing there of course). We turn right at a road that has another sign to the Kings Plains National Park. This road heads north and after 5.3 kilometres a track comes off to the left. This leads into the national park. 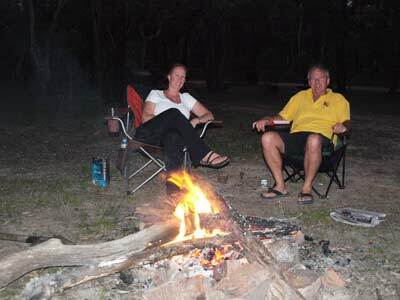 It is four kilometres to the first camping area (Ironbark Camping Area) and another 850 metres to the other camping area, Kings Plains Creek Camping Area. 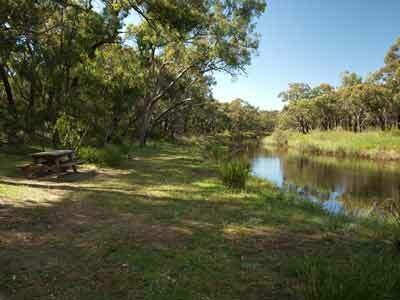 At 1:05 pm we arrive at Ironbark Camping Area and have a look around. We decide to have lunch and then go to the other camping area to see what it is like. This is a nice spot, with two tables and barbecues, but no toilets. The creek is close by, but for swimming it looks a bit hard to get in. 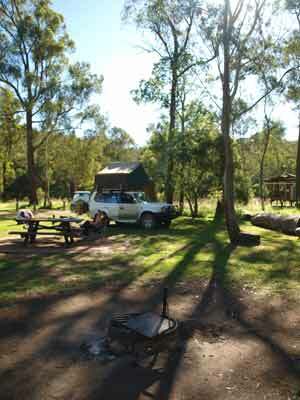 After lunch we drive to Kings Plains Creek Camping Area. This is on the edge of a larger part of the creek, it is almost like a small lake. This has green grass, a toilet, a couple of tables and some barbecues, but it would also be difficult to get into the water as it is a steep drop. There is one bloke here, a bird watcher. 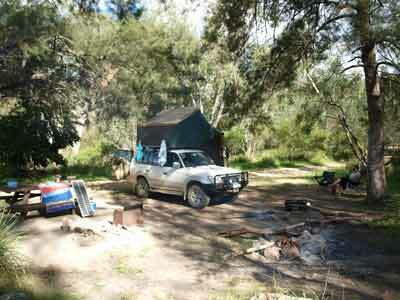 This site is not set up for roof-top tents or camper trailers, so we decide to go back to Ironbark Camping Area. We set up camp under some trees (ironbarks of course) and put our chairs in the shade. We spend the rest of the afternoon reading and looking at the fantastic birdlife. We see little lorikeets in small flocks (they sort of sound and look like budgerigars), superb blue wrens, brown tree creepers, eastern robins and more. It is really nice here, we have the place to ourselves. Once again we have hot showers as drink time approaches. It is nice to camp at a site where you can get good water, makes the showers so much better. At 5 pm we have drinks and nibblies as normal. Dinner tonight is Mexican beef. These are from Wooloworths and the beef is pre-marinated and vacuum sealed. It is quite thin and easy to cook. We get out my bidji barbie and using a small amount of timber, get a fire going. The good thing is this barbecue does not need much to make it work, you can cook a steak using a few handfuls of small twigs. To cook the beef, you do it for about five minutes each side (the packet says four, but I find that too rare). Then you let it rest for a few more minutes. We are having with pasta and salad. This is a really good alternative to a proper roast and just as nice. After dinner we read some more. About 9 pm it gets windy and this lasts all night. We had the coldest night of the trip so far last night. It is hard to imagine that we are at 890 metres as we have not seen any mountainous country for days. We get up at 8 am as it is already 18ºC. After breakfast we leave at 9:05 am. 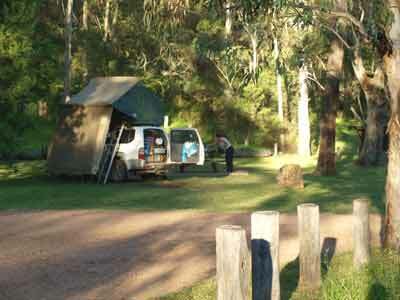 We go to the Kings Plains Creek Camping Area to take a photo (we forgot yesterday) and to use the toilet. We are off soon after on our way to Inverell. We head back to Kings Plains Road and turn right. It is 50 kilometres to Inverell and we get there at 10 am. Along the way I get a message from my sister Cathie that my Uncle Michael (Samuel Michael McFadyen) died last night. He was Dad's brother and it appears he dropped dead in the Paterson Hotel when selling raffle tickets. This means that it looks like we are having a third straight bad year. 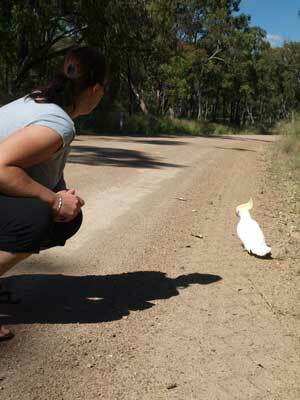 A bit further down the road we come across a white cockatoo on the road. It does not fly off as we approach so we stop. It has a broken wing. Poor thing. I think about bashing over the head, but I figure that it may survive if it can get into a tree with some seeds or flowers. In any case, it runs too fast to easily catch. Poor thing. We stop in Inverell for a few minutes to get a newspaper and some margarine. I have never been here before, it is a nice looking town with lots of old buildings. We leave at 10:20 am and head out to Tingha. 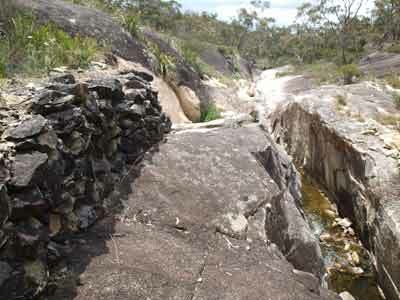 Our plan is to try and visit Stonewoman Aboriginal Area. 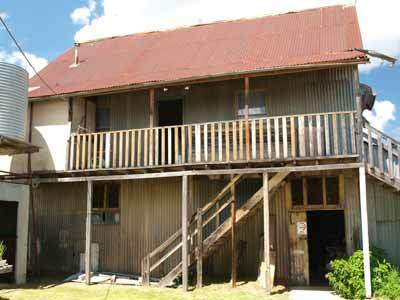 When we get to Tingha (26 kilometres), we see the historic Wing Long Museum. 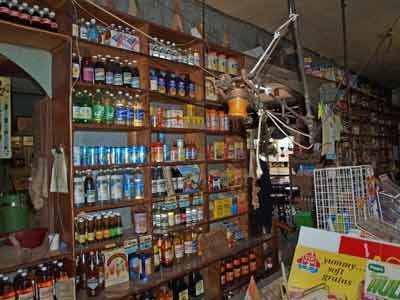 This is the old Wing Long Emporium, the old Chinese owned general store. We go in and have a look around. It costs $2 a person and is well worth the cost. This is an amazing old store, still set up in some ways from the early 1900s, with devices to send money from the floor up to the cashier and for receipts to come back. The shop closed in 1999 (I think) and there are still goods from before that on display. There are old style ladies clothing from the early 1900s as well as much much more. 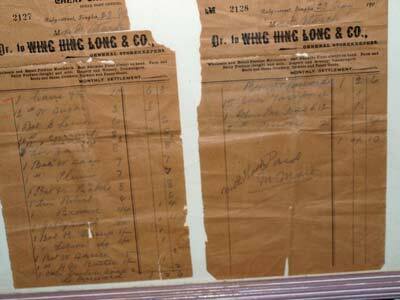 There are even the old sales books from the early 1900s and some receipts. Very interesting. In the back storage shed there are boxes of items with expiry dates from the 1980s. 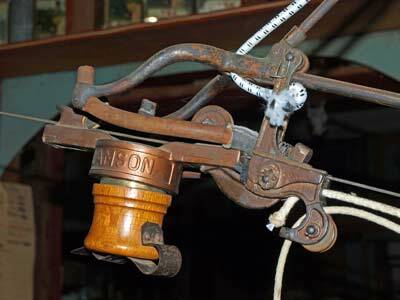 As well as foodstuffs and clothes there are hardware items and more. Above the storage there is the house. Also interesting as it is so basic. 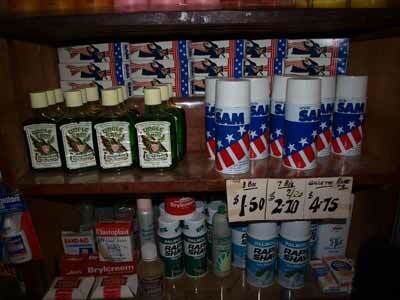 There is also an attached barber shop and chemist, again with lots of old goods. We also decide to have morning tea here, $4 for Devonshire tea. We end up spending so long here (an hour) that we now have no time to find the Aboriginal area. We head south-west and then take Thunderbolts Way (the same road that goes from Gloucester to Walcha) south to Bundara, a beautiful little town. From here we take the Gwydir River Road and then Torryburn Road till at 12:40 pm we pass through the locality of Kingston. This is 84 kilometres from Tingha. South of here we take the Bendemeer Road till we come to Retreat Road and then Glenbarra Road which goes to the west. 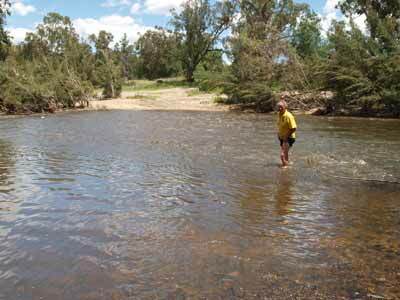 At 1:35 pm we come to a causeway across the Namoi River. Back 10 or so kilometres there was a sign saying the road was closed and the bridge out. However, we did not know where this was as the name meant nothing to us. I have known all along that we had to cross the river on a causeway, so this does not matter too much. We are 128 kilometres from Tingha. However, the river is flowing quite strongly, but it is not very deep. I think we can easily cross it. As I start to walk across to check the depth, I notice a sort of army style bridge about 40 metres downstream. I turn around and go back to the car. No point going through water if we can avoid it. Kelly has written in our diary that it is "a dodgy metal bridge". She is right, it is dodgy. I walk across and test the strength. The worst looking bit is right at the start, so I figure as long as I can get the front of the car past this I will be okay, even if it collapses (it is only 0.5 metres above the water). I send Kelly over with the camera and turn on the GoPro video, we might as well have footage if it does collapse! I slowly edge onto the bridge and once on, give it a bit to get across fast. It creaks and groans and wobbles a bit, but I get across. 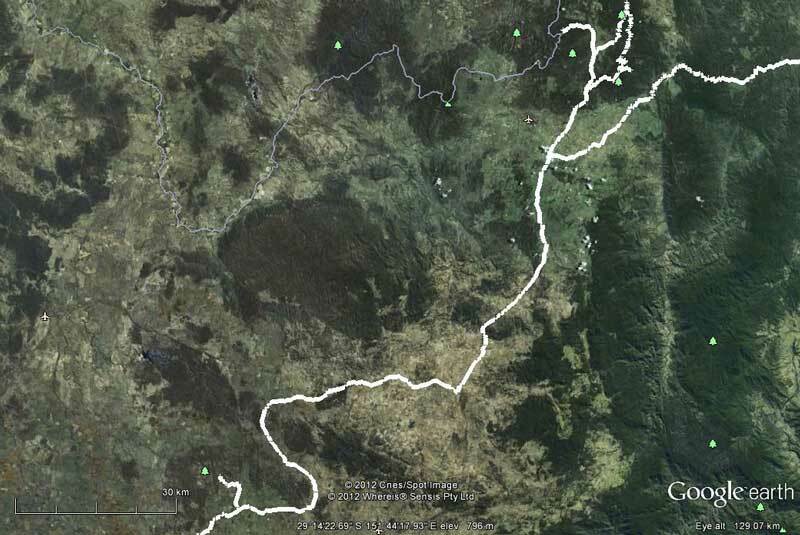 Now we are on the western side of the Namoi River and we turn north (right) towards Warrabah National Park. 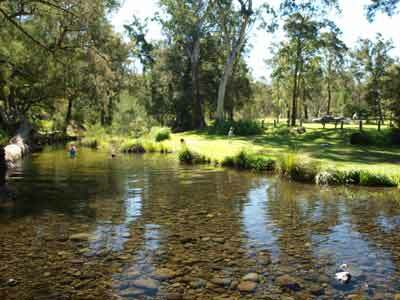 The park is located along the Namoi River and it is only about eight kilometres to the main camping area. Just before we enter the park we see some very poor looking sheep in a paddock on the right. They look distressed, with their wool hanging off them in spots. We think we should call the RSPCA but being slack, we don't. When we enter the park we are amazed to see that it is packed. There are dozens of cars here, both day trippers and campers. The national park web site only has very limited information about the camping here and only shows one camp site. However, there are actually three. 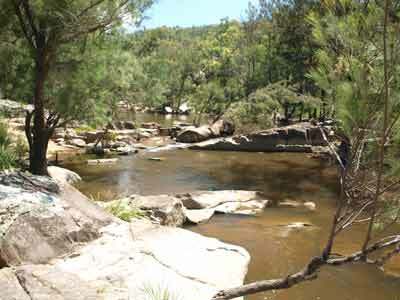 We drive right through the first one (Warrabah Camping Area) and find it is very full. 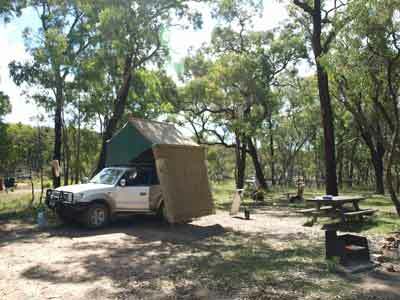 We do not see a vacant spot, although as we leave and climb up the four wheel drive track we actually see a place behind another camp site. We will come back to this spot if need be. It is almost four kilometres from this camping area to the next one. The track to the other camping areas is very steep, and a normal car might have problems with clearance at a couple of spots. It is slow going, about 12 km/h. We first stop at Boundary Hole Picnic Area but it is a long way from the water. We arrive at Gum Hole Camping Area at 2:15 pm. 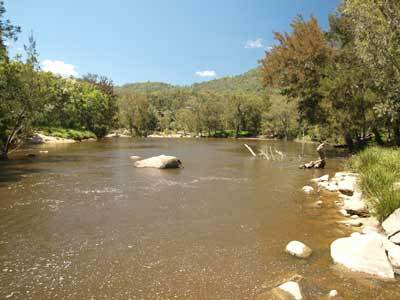 This is right on the river but is nowhere as big as Warrabah Camping Area . There are two other vehicles here. One is near one end and the other is towards the far end. The problem with this camping area is that there are huge amounts of timber that has been washed down the river in the recent floods all over the place. Many of the sites are totally covered. There are really only two spots we can pick from, so we decide on the one nearest the entrance. This is flatter and clearer of timber. We set up camp. We have a table as well as a fireplace and there is a toilet her as well. There are lots of very large goannas here which walk around the camp sites. As we are having a late dinner (because it is New Year's Eve), we do not eat lunch till now. Cold pizza is great! After this we go for a swim in the river as it is pretty warm, about 30ºC. It is really nice in. We go back to the camp site and set up a lot of our things for tonight. As we walk back, we collect some of the timber for our fire. We need lots tonight to cook our roast dinner, dessert as well as to keep the fire going till midnight. At 4 pm I start the fire and use a lot of timber, no need to skimp tonight! We read in between doing things. We have another swim at a spot to the north of where we are camped. This is a much better spot than the first place we swam (well, we are not really swimming, just lying in the river). I start the preparation of my apple crusty pudding, and have it ready before 6 pm. This is for a late dessert. Another couple of cars turn up with some young people. We are hoping that they are not too rowdy, but we hardly hear them. We start drinks later than normal so we will make it through to midnight. Every time we go for a walk, we collect some more timber. I also use some of the timber I collected yesterday and by 7:30 pm I have excellent coals. I put the roast beef on. We add the vegies about 20 minutes later and by 8:35 pm it is all ready. We have a great meal of beef, pumpkin, carrot and potato. As usual, after a couple of beers and wine we crack open the sparkling wine. This year we again have Greyrock Sparkling Sauvignon Blanc from the Marlborough region of New Zealand. An excellent drop at about $16 a bottle (much less if on special). It is a warm night and for the first time for many days I do not need a jumper at night. At 9:45 pm I put the apple dessert on and take it off at 11 pm. We have it with double cream. Another tradition started a few years ago is that we play Uno leading up to midnight while drinking sparkling wine. Kelly beats me five games to four! We see in the New Year, then go to bed at about 12:15 am. It has been another great New Year's Eve, you do not need a big crowd to have a good time! After the late night, we do not plan to arise till later than normal. However, by 9 am the sun is shining on the tent and it is getting too hot. Outside it is only 17ºC but as it is hitting the tent, it is a lot warmer inside. We get up and go for a swim to wake up. This is very nice and refreshes us. I cook bacon and eggs for breakfast (to soak up the alcohol from last night!) and this is a very nice start to the day. We gradually pack up and once the car is loaded, we drive to the other end of the camping area to have a last swim before we leave. I am almost feeling human by now. After the swim we drive to the other camping area, Billys Hole Camping Area. This is about 700 metres past the turn-off to Gum Hole. We leave at 11:20 am. 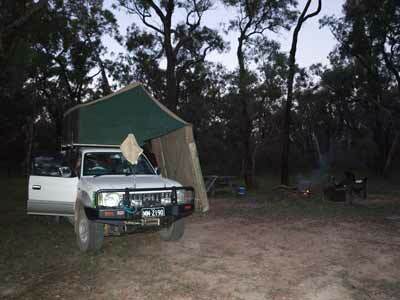 It takes 14 minutes to drive the 3.9 kilometres back to the main camping area. We head south towards Manilla and arrive there at 12:20 pm. From here we take the Fossickers Way to Tamworth and then the New England Highway south towards Newcastle. 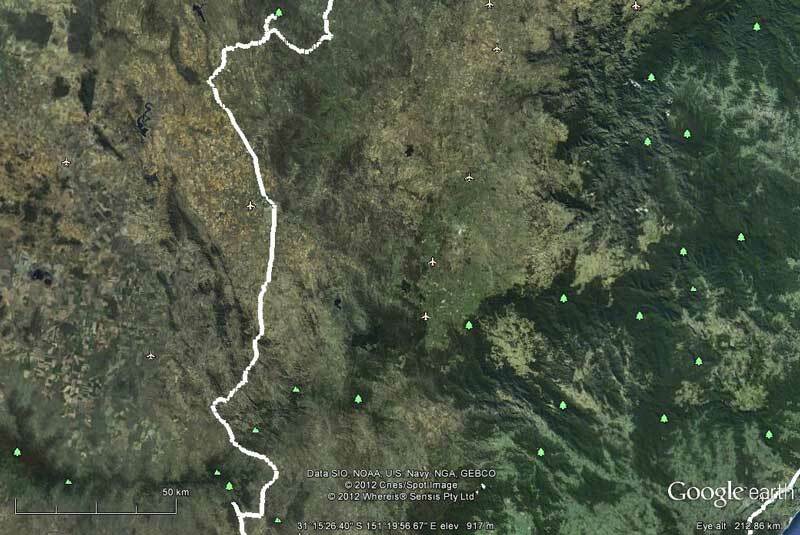 At 1:35 pm we stop at Wallabadah. This has a general store that for the past few kilometres has been proclaiming how good its hamburgers are. I order a plain hamburger (as per the menu) but then get confused by the owner as she asks if I want onion and salad. Yes, I want a plain hamburger I say. Do you want onions and salad. It seems that to her, a plain hamburger has no onions and salad, despite what is written on the menu. We finally work it out. As we came into town we could not figure out why the pub was so crowded. Then we see some more people in their best clothes go into the pub. We figure that there must be something special on. While we eat our hamburgers (very good by the way), a bunch of them walk up from the pub past us. I figure that there must be a horse race meeting on somewhere. We leave at 1:50 pm and, sure enough, a few hundred metres up the highway is the Wallabadah Racecourse and they have a New Year's Day race meeting. It is now very warm, 31ºC. We stop at Willowtree for a wee break (nice park and rest area). At 2:35 pm we arrive at the Burning Mountain Rest Area just before Wingen. This is just off the highway. I want to take Kelly to see the burning mountain. I have not been here since I came as a schoolkid in year 7 back in 1970! From memory I had thought that it was only a short walk but it seems either my memory is faulty or the spot we walked from was different to this (I actually think it is both). It is 4.6 kilometres return and it takes us an hour to do the walk. It is steep in spots and if is very hot now, probably 33ºC. 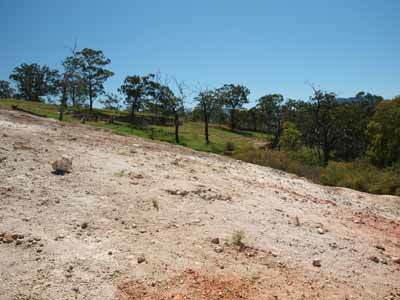 Burning Mountain is a coal seam that is on fire and gradually moving to the south. 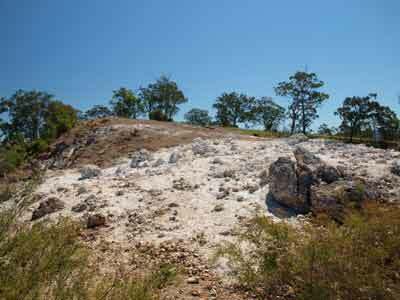 It has moved about 6,000 metres over the 6,000 years it is believed to have been burning for. It is quite incredible as in spots the ground has dropped where the coal has burnt away and in other spots there is no undergrowth at all due to poisoning from the fumes of the burning coal. It is an easy walk back. You could camp here in a caravan to roof-top tent as there are no signs prohibiting it. We are heading for Towarri National Park which is north of Scone. We leave rest area at 3:45 pm and head down the highway towards Scone. However, we turn-off the highway at Parkville as there is a road that goes across. It is a good tar and dirt road. We arrive at Washpools Camping Area at 4:05 pm. This is in Towarri National Park. It is a beautiful spot, with a very green and grassy camping area right next to a small creek that has a nice swimming hole. You need to cross a concrete causeway to get into the camping area but unless there is a flood, you will not have a problem, even in a two wheel drive. The only people here when we arrive are some families swimming in the hole. They are obviously not camping, just day trippers. We drive around and look for a spot and are disappointed to see that the best sites near the river are really impractical for roof top tents or camper trailers. There is a fence dividing the car area from the camping area. There is no real reason why cars should not be able to park closer to the creek. We end up selecting a flat spot (about the only one apart from those in the car parking area) up high near the toilets. There is a fireplace and table here to use. There is also a shelter shed with gas barbecues, but inexplicably it is located at one end. Perhaps it is for the day-trippers I think. We are also astounded to see that the cost to camp here is $10 per person per night. This is by far the most expensive of the trip and it has less facilities than the $5 a night ones (eg no tapped water). What's more, day-trippers do not need to pay and they seem to be the biggest users of the gas barbecues. In any case, we do not pay as there are no envelopes to record our payment on and I am not leaving money in the slot without any receipt. As it is hot, we go and have a swim in the hole. It is very nice and cools us down (it is still up near 30ºC). About 5 pm four cars come in but they go to the barbecues and are obviously just having dinner here. Another two cars come in later, both camping on the grass near the creek. The high cost of camping here (you can get a site in a caravan park with hot showers for around this price) obviously stops people coming here. We have drinks and I start a fire. We have a lot of timber and I want to use most of it up. While it is still 28ºC at 6:00 pm, it looks like it will cool down. Kelly is cooking meatballs and spaghetti for dinner and she gets this underway. Sure enough, as soon as the sun drops below the top of the trees and over the ridge, it gets cool. After dinner, we walk to the Washpools Picnic Area. This is on the other side of the creek and about 300 metres further along the road. All afternoon there has been a steady stream of cars leaving there. When we arrive we find a very large picnic area, with lots of tables, gas barbecues, shelter shed and toilets. There is only one car left and they are packing up. There are steps down to the creek. 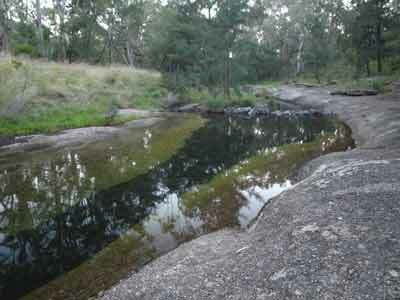 Here there are many nice waterholes to swim in. They stretch for quite a way up the creek. A very nice spot. We walk back to the camping area and read for a while. The young couple that came in earlier and are camping near the creek come over. They warn us that they think their friends are coming from Scone to party with them. However, it turns out to be a scare tactic on behalf of the friends, probably trying to upset their night alone. It gets really cold and before long it is only 10ºC, by far the coldest temperature we have had the whole week. I am glad I decided to get a good fire going. We read more and go to bed about 10 pm. Well, it really was cold last night. Luckily we were prepared, having once before being caught out when camping over summer. It is still only 8ºC at 7 am but by 8 am it is 13ºC. The sun is on the tent and it is too hot inside so we get up. We have breakfast and then pack up. 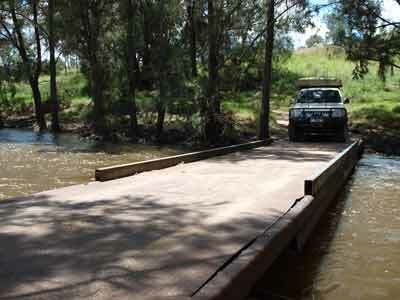 We move the Prado down to the swimming hole and have a swim. Very nice. We decide to read for a while and then have morning tea. I have arranged to go to my Aunty Rose's place to see her as she is very upset over the death of her brother (two now in 18 months). Her daughter and my cousin, Michelle is home on holidays and another cousin, Debbie, is also going to be there. We do not want to get there till about lunch-time so we have no need to rush. We leave at 10:23 am. It is a nice sunny 23ºC day and we head to Scone and then down the New England Highway. We detour off at Maitland and visit Rose. We spend an hour and a half with her before leaving for home. She is so upset, Uncle Michael was particularly close to her. We have a good run home and get back to Kareela at 4:45 pm. Once again we have had a great time, apart from the news about Uncle Michael. This is a trip that you could do in any vehicle, with some minor alterations. I strongly recommend it to you.